Former North Carolina Tar Heel star Vince Carter is suffering from delusions of ethnicity. 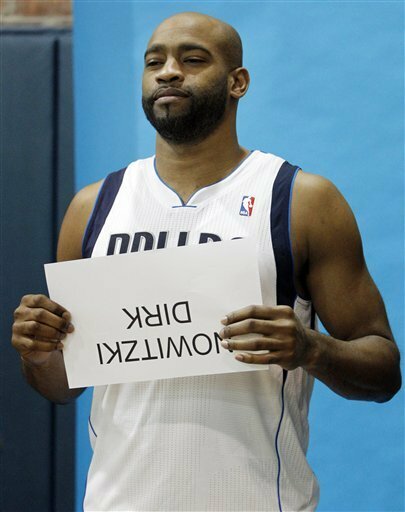 The 6’6”, 220 lbs NBA star who was born in Daytona Beach, FL now believes he is living in an upside down world where he is actually German Dallas Maverick star forward Dirk Nowitzki. Carter played for UNC from 1995 to 1998 and was chosen 5th overall in the 1998 NBA draft by Golden State. Carter has since played for the Toronto Raptors, the New Jersey Nets, the Phoenix Suns and the Dallas Mavericks. He has been named NBA Rookie Of The Year in 1999, to the NBA All-Star team eight times and has won the NBA Slam Dunk Contest (2000). That said, he is not Dirk Nowitzki.